1. The Protagonists & Alternating Points of View. There are two points of view--one from our heroine, Puck Connolly, and the other from our hero, Sean Kendrick. A lot of the reviews I had read said that it was hard to identify with Sean because he was so closed off, but to me, he wasn't that closed off. He seemed closed off from Puck's perspective and the way everybody else treated him, but his point of view showed so much more. (And honestly, he seemed so lonely that I just wanted to hug him.) Puck and Sean have two very different types of strength: Puck seems to get her strength from her love for her family, from her stubbornness, from a genuine appreciation of the island while Sean gets strength from his love of the horses he cares for, from Corr, from living for nine years without (really) relying on anybody but himself. I loved how different their perspectives were... but I also loved how much they seemed to fit together. I have been thinking a lot about Veronica Roth's blog post on insta-love, particularly since The Scorpio Races was listed as an example of a book that had a couple fall in love rather quickly. But the thing is, with this book, the romance doesn't even feel like insta-love. I do think they fell in love, but it's not exactly named, and Maggie Stiefvater makes you want to believe in Puck and Sean as a couple. They feel like puzzle pieces put together, and they balance each other's personalities. 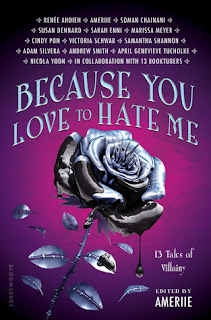 I fell in love with the idea of them falling in love, and Veronica Roth was right with this: Maggie Stiefvater convinces me that it can happen for some people. I am so glad that this book might be developed into a movie (as Maggie Stiefvater announced on Twitter). Every character you meet has a certain quirk, something that just makes you believe in his / her existence. I want to meet every one of them and I particularly love the dynamics between the people of Thisby--what is said and what goes unsaid. It will make for a great film if whoever picked it up gets on that. Maggie Stiefvater is an author I greatly admire. Her writing always paints such vivid descriptions that for me at least, I feel like I'm actually there with the characters. Also, if you're a writer looking to study how other authors create certain moods or handle pacing, look no further than Maggie Stiefvater. It's no wonder this book has gotten five starred reviews. Maybe it's the topic of the books. Maybe it's the writing. Maybe it's the characters.... but whatever it is, this book is like nothing else I've ever read. I want to believe in Thisby. I want to believe in Puck and Sean. 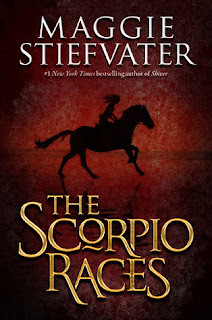 I am both fascinated with and disgusted by the Scorpio Races. I wonder what it would be like to encounter a water horse. There's so much about this book that I love and that feels magical, and I think that part of it is because of all the details. Maggie Stiefvater makes the descriptions come to life, makes them seem real just by how detailed they are. If you're somebody who likes to read faster paced books, maybe this isn't for you. 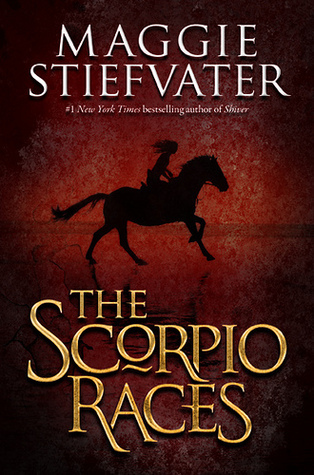 But if you're somebody who's just looking for a good story, check out The Scorpio Races. You won't be disappointed. I just got this book on the mail last week and I'm daying to read it. Thank you for your review. Love your review. I thought The Scorpio Races was exceptional. Ah, see, this has given me a completely different perspective on the book. I need to read some Maggie Stiefvater. Interesting. I really love the Shiver trilogy, and I LOVE anything having to do with the ocean and all of it's creatures. Can't wait to read it! to read a standalone novel that is bewitchingly suspenseful.